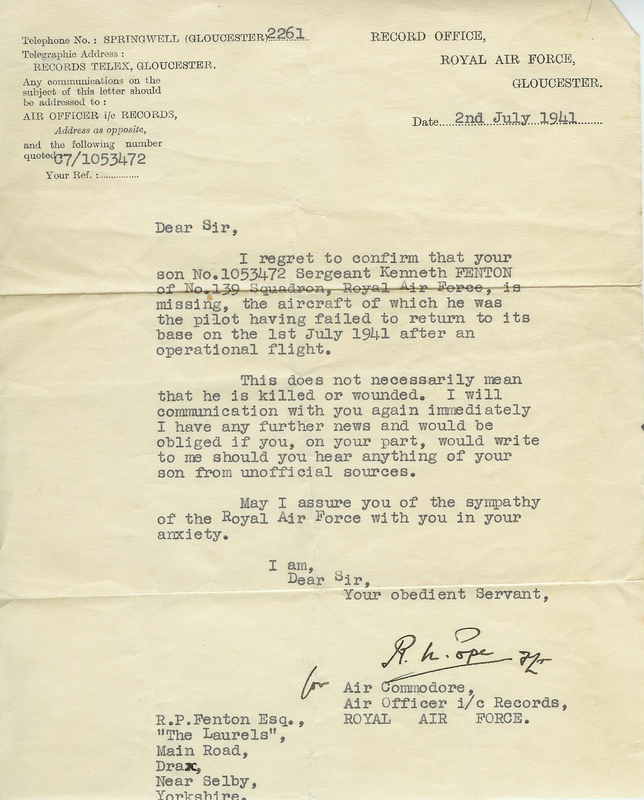 This was normal, firstly a telegram, and letter from central records followed by a letter from their commanding officer. All the information received at home.This was normal, firstly a telegram, and letter from central records followed by a letter from their commanding officer. At this time, no one knew of his rescue. McDonald, having been injured during the flight, crash, ditching and capture was at this point separated from Fenton and Fuller and was taken to Amsterdam Hospital for treatment where he remained until 20th July 1941. After two or three days of interrogation by both the Luftwaffe and Gestapo the rest of the Blenheim and the HSL crew were taken by train to Dulag Luft at Frankfurt-am-Main, where they were separated from Captain F/O Jackman. Dulag Luft, short for Durchgangslager der Luftwaffe was a transit camp, where all captured aircrew were taken for interrogation before being moved off to their main camps. All the various crewmembers received additional interrogation from bogus Red Cross personnel and were asked to fill out additional forms. Kenneth Fenton, the Luftgangster, arrived at Dulag Luft, near Oberursel, Frankfurt am Main on 6th July 1941 and officially became a ‘Kriegie’, the shortened version of the German word Kriegsgefangener or war prisoner, which was used by the POW’s to refer to themselves. Upon their arrival, each prisoner was allocated to a ‘cooler’ or reception room but not before they were escorted to the washrooms and under very close and strict supervision, they were allowed to use the toilet as the Germans were aware that many things had already been flushed down the toilet of secreted upon the prisoners person. In the cooler, the prisoner was forced to strip completely, all possessions and clothing was taken away, leaving the prisoner naked in a small panelled room with a single bed. They were then given an army uniform to wear, one that was probably captured with the many supplies left after the British Army’s withdrawal from Dunkirk and medical treatment was provided if it was needed. The guards were very friendly and happy, giving then tea or coffee and biscuits, before being left for the night. The prisoner could see through the window pleasant gardens and a river in the distance, all designed to relax the prisoner and get him off guard. Their clothes were searched for any escape aids concealed in the collar, linings or pockets which would include compasses, silk maps, wire, gold coins, etc. The next day, the prisoner’s interrogation would commence in a very subtle way, no threats of harm or mistreatment. This would start off with a German posing as a Red Cross Official, offering cigarettes and chatting with the prisoner to get his confidence, assuring him that this was in no way connected to the German Forces and that he had no interest in any military information the prisoner may have. Telling the prisoner that any information that he told them was for the Red Cross in Geneva only and would not be passed on to the German authorities, trying to convince the prisoner there was no reason not to tell them, telling they were only interested in their welfare and their ability to let their family know they were safe. After a while and promises of the return of their personal items and time for them to write home to tell their family they were safe, the ‘Red Cross Official’ would produce a Red Cross form to be completed and signed by the prisoner following many questions from the German. The prisoner was only obliged to give name, rank and number and had no obligation to provide any other information, being asked their squadron number, target, bomb load, defensive armament, how they got shot down etc. The prisoner would have been told that contact would only be available through their squadrons so they needed the information to get in touch with the right person, saying that German intelligence would know the answer to this question anyway. He would then be told that without this information, the prisoner would not be able to receive any parcels or letters from home or indeed inform them that they were safe. This was usually met with the repeated name, rank and number and the ‘Red Cross Official’ departing, looking very upset. This was usually followed up by a very Fatherly acting German Officer, Major Rumpel, the camp Commandant who told the prisoner that he was very sympathetic to his parents, not knowing what had become of him as he also had a son who was a Luftwaffe pilot fighting on the eastern Front and he understood what his parents must be going through. He talked about politics or whatever interested the prisoner, slowly trying to get his confidence, asking why his country was at war with Germany, did he agree with it, etc. and giving advice on how to survive in the prison camps during the long years that were going to follow, wishing them a pleasant stay. What effect this would have on a young pilot, miles away from home, having suffered already the shock and fear of a crashed aircraft, is difficult to know. It is clear however that you would want your parents to know that you were still alive. What harm could that do? But it was the start of the slippery slope and could lead to more information being supplied or lies being detected. What was clear that the Germans knew a great deal already, squadrons, strength, aircraft type, station, station commanders name, probably just lacking bomb load and fuel load. This would have also shocked the new POW’s. From records, we know that Ken gave his Father and Mother’s name and address but that was not unusual. Depending on the information obtained or the level of interaction, the German guards would probably cease their interrogation there unless they saw any chink in the resolve of the prisoner, which could be further exploited but if not, they would be released into the main compound with the other prisoners. In July 1941 there were about 100 aircrew prisoners in Dulag Luft, the result of approximately 10 days of bomber and fighter raids. Dulag Luft was first opened in December 1939 as a small camp on the edge of the Taunus Hills, previously being part of the campus for the University of Frankfurt. It was the instruction that all captured airmen were to be taken here with any documents or paperwork retrieved from their downed aircraft. It comprised two long barrack huts split into rooms for 4 or 5, one hut for officers and the other for NCO’s. There was a third hut which was the library, games and concert room and was split up at meal times to provide a separate area for the Officers and Sergeants mess, separation was encouraged as was dissent between the two levels of seniority. Hot showers were available anytime and a large grass covered exercise area allowed the prisoners the chance to wander around. The BBC was also broadcast at 9.00 PM every evening and the propaganda radio transmitted to allow the prisoners to listen to Lord Haw-Haw, listing out the prisoners now in German hands. Within its buildings, Dulag Luft, had every known device for extracting information from the captured airmen, and they knew all the tricks as to how to get the information from any unsuspecting prisoners of war, including hidden microphones behind the wooden panelling. The passers through were warned to only talk in the exercise yard and then to trusted aircrew only but it became obviously and was talked about that more worryingly, genuine Air Force officers had now turned to the German cause and that the permanent Air Force staff responsible for running the camp at Dulag Luft could not be trusted. A difficult situation that the novice prisoners would find themselves in, wanting to notify their Family that they were safe. They were told that if they co-operated then they could confirm to their families that they were alive and well and that they would be well looked after. Robert Morton would meet up with his old flying comrade, James McCairn here at Dulag Luft. The German’s first started to realise the importance of any information held by captured service men in the First World War, especially airmen, and established a series of ‘hotels’ where they were initially taken and looked after with excellent food and accommodation. They were however first taken to the Squadron or gunnery unit that claimed the ‘Kill’ for their celebratory meal, where they were wined and dined and treated like a hero. This was probably where their interrogation first started, when information would be coerced out of the downed and confused airman. It must be remembered that immediately upon capture, any prisoner would be in a confused state, realising for the first time that his continued survival and well being was now in someone else’s hands and it was difficult to prepare him for that, even in the second world war, when they had knowledge of what prisoners experienced in the First world war. These ‘hotels’, in the First World War, were quickly adapted to assist in collecting any information possible, putting downed aircrew of similar rank together to make them feel at ease and encourage them to talk, gaining valuable information, both passive personal information and direct information on military tactics, strength and numbers, etc. The Germans played the card very well, relying on the very British tradition that a Gentleman does not listen to another Gentleman’s conversation. The Germans had no such views and placed English speaking waiters and guards around the hotels to specifically listen to all the conversations. They also became experts in listening equipment, hiding a range of devices around the rooms to listen in on all the conversations being held and collate the information gained. It did not take too long before the prisoners realised what was going on and for them to find some of the listening devices and to warn the immediate people around them. They were also able to leave notes, hidden in the rooms, warning those that followed about this practice but these notes had to be well hidden from the guards so their eventual discovery by prisoners following on was also in doubt. What it took quite a while to do, was to inform British intelligence back home of this practice so that they could prepare servicemen going to the front in case of their capture and imprisonment. It was probably not until after the First World War that the true extent of this subterfuge became apparent but even then it took time for the training to get into gear. 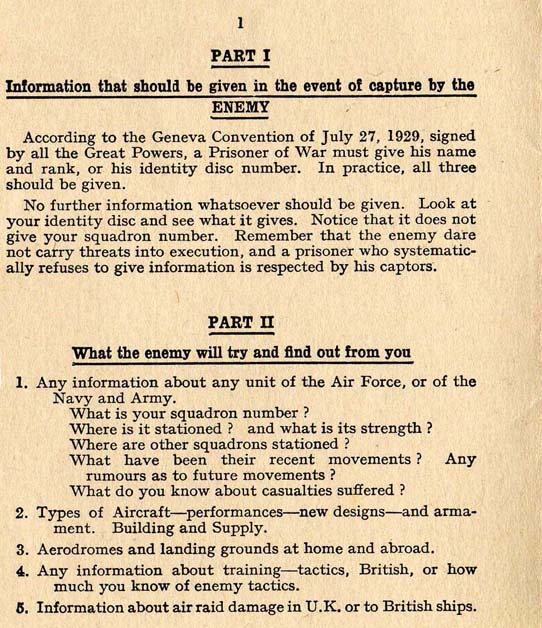 Escape and evasion and related training in the case of capture was the responsibility of MI9 (MIS in the USA as noted at the top of the liberation questionnaires) and through its executive branch Intelligence School 9 (IS9). Established in December 1939, MI9 took a while to get working properly and the BEF were not instructed in coded message writing, but this changed after Dunkirk. Priority of training was towards those most likely to find themselves behind enemy lines, so the RAF and ‘special forces’ were top of the queue. 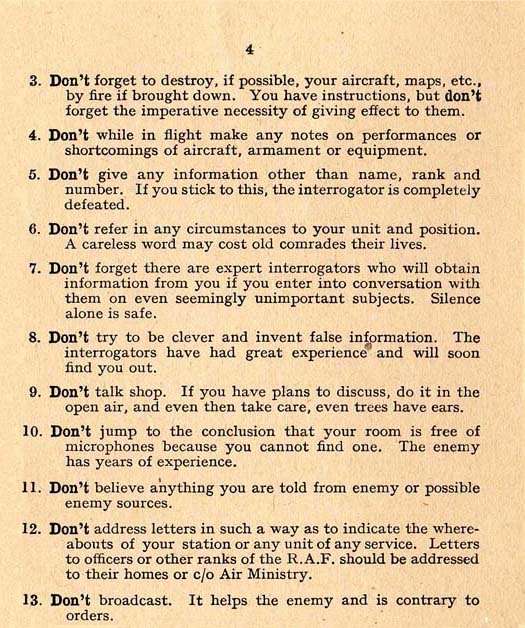 MI9 arranged, throughout the aircrews training, to instruct them on techniques of evasion and escape, how to behave when captured and in a few select cases, mostly Officers, for security reasons, how to communicate in coded messages via letters home. They also arranged for the preparation and supply of escape aids, the sending of newsletters to POW camps to help with morale and, having learnt a very important lesson from the Germans in World War 1, they initially were responsible for the bugging of enemy POW conversations, but this was later split off from MI9 to create a new organisation MI19. They were also, in conjunction with SIS, responsible for the organisation of escape lines across Europe to get evaders and escapers home. As part of MI9’s programme, all aircrew were issued with standard Evasion and Escape equipment, including some local currency contained in a purse, silk maps (to be sewn into the airman’s clothing), compasses of various sizes (including substitute buttons, etc.) and aid boxes incorporating food, fishing line and hook, water, etc., sufficient for 48 hours on the run. Where the crew were to be operational over Germany where they could not expect to be helped or indeed in the Far or Middle East, additional aid boxes would be provided. Ken, like most newly trained aircrew, received training about the possibility of capture and what to expect at No. 13 Operational Training Unit. He was told how to behave, what he should or should not say under interrogation, the power of the Geneva Convention and what it meant, what interrogation to expect, etc. latterly, during the War, the trainee aircrew were lectured by aircrew who had been captured but escaped, giving them first-hand experience on methods of escape, what to take with them, methods of survival, etc. but this in no way prepared them for what was to follow. 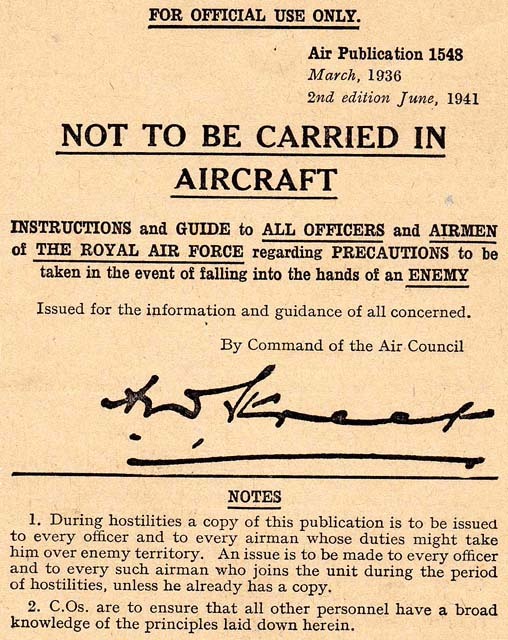 Air Publication 1548 Dated March 1936, Second Edition June 1941, Instructions and Guide to all Officers and airmen of the Royal Air Force regarding precautions to be taken in the event of falling into the hands of the Enemy. It told them that it was the duty of all ranks to protect the security of their Country and the Royal Air Force and that the Geneva Convention of 1929 required any captured airman to only divulge his Name, Rank and Number and that no pressure should be exerted to find out any other information. It went on to say that the captured aircrew would be respected by his captors if he systematically refused to give information under interrogation. The aircrew were required to stand correctly at attention, give their name, rank and number and otherwise maintain a rigid silence, avoiding even using answers such as ‘Yes’ or ‘No’. If pressed, he may answer ‘I cannot answer that question’. He should at all costs avoid any attempts to bluff or tell lies at all and maintain throughout the interrogation a disciplined and strictly formal professional attitude, addressing any officers as ‘Sir’. He should avoid all fraternization, and refuse all favours, establishing from the outset that he is the type from whom nothing can be learnt. The aircrew were told how the interrogation would not just be a formal interview, but would continue, in a more relaxed manner afterwards, by bogus Red Cross personnel or people pretending to be other Allied soldiers or indeed, collaborators. Information about any unit of the Air Force, Navy or Army. Where were you stationed and what was its strength? Other squadrons and where were they stationed? What have been their recent movements? Any rumours as to future movements? What do you know about casualties suffered? Types of Aircraft–performances–new designs–and armament. Building and Supply. Airfields and landing grounds at home and abroad. Any information about Allied training and tactics–and how much you know of enemy tactics. Information about air raid damage in U.K. or to British ships and their effectiveness. Anything about the weather, recent or forecasts. Air Defence organization and A.A. Defences. Home Conditions – Politics, Food Supply, Spirit of the People and serving Forces. They were warned, as were the whole population, against a few careless words and how it could adversely affect the war effort. Examination of captured aircraft and material. Search of prisoners of war for note-books, letters, diaries and any other incriminating articles or papers to be found on their person. The commonest trick of all. Prisoners are well treated, entertained and given plenty to drink. An atmosphere of good fellowship is carefully built up and Service matters are then casually discussed. A skilled interrogator will be present to guide the talk into the right channels. These are always extensively used, and are sensitive to the slightest whisper. Some will be so cunningly hidden that not even an expert can find them. Stool-pigeons, speaking perfect English and carefully briefed, will be introduced among prisoners. They will not be easy to recognize, and may even be the first to warn every one of the need for caution when discussing service matters. The Enemy will have agents working among the nurses, doctors, attendants or guards who look after prisoners. These may either pretend to be sympathetic; or else pretend that, they cannot understand English. Like the stool-pigeon, they will be good actors and very difficult to recognize. Know-all approach. 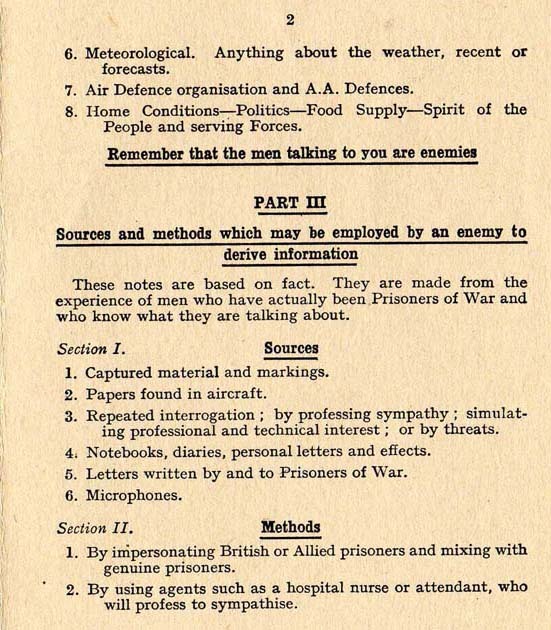 “We know everything already, so there is no point in you keeping silent.” It may be suggested that another prisoner has already talked; or an imposing-looking file may be produced which appears to give detailed information about R.A.F units, aircraft, equipment and personnel and may contain a number of photographs, newspaper cuttings and other such items. A prisoner may be threatened, or attempts may be made to bully or browbeat him. A ‘fake’ shooting of other prisoners may be staged. Blackmail may be tried. Ill-treatment may occasionally be resorted to by the Enemy, even though the Geneva Convention forbids it. Attempts may be made to lower a prisoner’s morale and to undermine his resolution by means of unsuitable diet: overheated cells; or solitary confinement. A prisoner may be offered preferential treatment, with special liberties and luxuries, if he will co-operate with his captors, either by talking himself or by persuading others to talk. A prisoner who collaborates with the Enemy in return for an easy life is a traitor. From the moment a prisoner is captured he is subjected to enemy propaganda. He will continually be told lies about the war situation, and about his country and her Allies, in the hope that his resolution will weaken, and that his courage will fail. These are only ten of the Enemy’s tricks. Be on your guard. In response to these potential threats, the aircrew were instructed on things to do and not to do. Do give your Name, Rank and Number, but nothing else. Do convince your interrogator from the very outset that you are the type of person who will never talk under any circumstances. Therein lies the whole secret of successfully withstanding interrogation. Do behave with dignity and reserve under interrogation, so that you command the respect of your captors. Do maintain your resolution and morale; and encourage your comrades to do the same. Do empty your pockets before going on operations. Do destroy your aircraft, maps and documents whenever possible. Remember that incriminating articles and papers can often be disposed of before the Enemy has a chance to search you. Do keep your eyes and ears open after capture, you may learn much which may be of value both to your country and yourself if you succeed in escaping. Don’t be truculent or aggressive under interrogation. You may regret it. Don’t try to fool your interrogators. They will be experts at their job, and in any battle of wits you are bound to lose in the end. Once you begin to talk, they have got you where they want you. Say nothing and go on saying nothing. Don’t imagine that you can find every microphone. Yon can’t. Don’t talk shop. A careless word may cost old comrades their lives. If you have plans to discuss, do it in the open air, but remember, even trees have ears! Don’t accept old prisoners on trust. Don’t believe enemy propaganda, and don’t let your comrades do so either. Don’t broadcast, no matter what inducement is offered. Don’t fraternize. The Enemy is not in the habit of wasting his time, whisky and cigars on those who have nothing to give him in return. Don’t give your parole, except under special circumstances. Don’t betray those who helped you to escape. A careless word after you have reached safety may cost them their lives. Don’t write direct to any Service address in the U.K., and don’t reveal in your letter that the addressee is in any way connected with the Services. Remember that the German censor will closely examine all your correspondence, and will note what you write and to whom you write. Don’t carry these instructions on you or in your aircraft. They are to help you and not the Enemy. A prisoner is always surrounded by his Enemies. Trust no one. 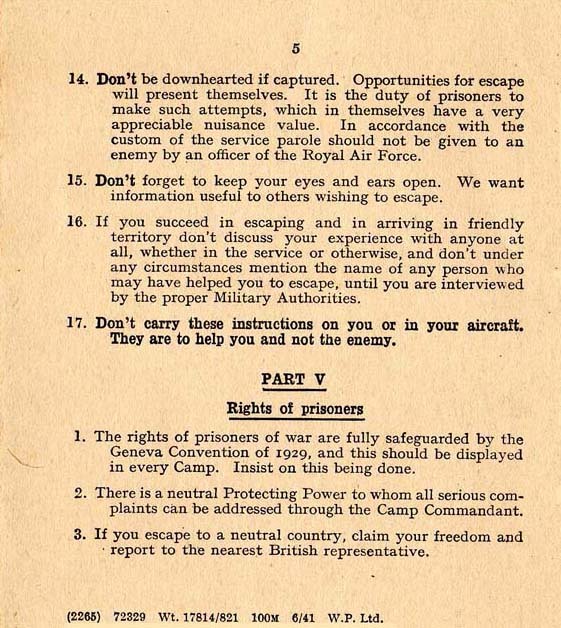 The aircrew were also reminded of their rights, as a prisoner, and that the rights of a prisoner of war were fully safeguarded by the Geneva Convention of 1929, and this should be displayed in every Camp and that they should insist on this being done. They were reminded that there was a neutral Protecting Power (Swiss Red Cross) to whom all serious complaints could be addressed through the Camp Commandant and that, if they were able to escape to a neutral country, that they should claim their freedom and report to the nearest British representative. Most of the POW’s acknowledged on their Liberation Questionnaires that they had received adequate training in the event of capture at their respective OTU’s or in some cases, squadrons, but a few stated that they either did not receive adequate instruction or had since forgotten about it, leaving them vulnerable to interrogation or inadvertent collusion. There are some examples of where some of these rules or guidance were not followed, either inadvertently or through brashness or cockiness or even for personal gain but generally it has to be said that the aircrew took their responsibility very seriously and were constantly watching and guiding others. The new prisoners were disillusioned, confused, feeling very vulnerable and it took the support network of those already there to stead them and settle them in, hence the fact that they were isolated for their initial interviews. They were still in a state of shock, ready to talk to make sure their family knew they were safe, first off only giving name, rank and number but surely some of the questions could do no harm? Who was your favourite composer, who you thought would win the war, your Father’s name and address, but every piece of information beyond the basics allowed the interrogator to build up a picture of your character, for them to find ways to extract further information from you. But to many young airmen, they only wanted to get a message home and it appears that Ken told them his parents’ names and address as well, and who can blame him. Based on what detailed information about the raid the German’s already knew, what harm could that do? The details of your parents was one of the first questions on the IRC questionnaire, which would appear legitimate but further examination of this document would soon make you realise that it was another badly disguised means for the German’s to find out as much as they could. In July 1941 the interrogation methods the Germans used were adequate but as the war progressed, so Dulag Luft improved as was needed to handle the increasing numbers of Prisoners passing through the camp and the advancement of technical equipment. It was also known back home that anyone who showed any inclination to chat would be retained at Dulag Luft to be petted and turned by the Germans and used to find out information. Anyone who spent more than a fortnight in Dulag Luft was suspected of getting involved and one RAF Officer sent photos home showing what a great time he was having there. Those who cooperated, it was supposed enjoyed a life of luxury, swimming in summer, skiing in winter and 20 men to share the camps entire ration of Red Cross parcels, eating at their own table in the mess rooms. Ken Fenton was obviously not of much use or they already knew what they wanted because he was only here for 4 days. Or had the family, friends or villagers heard Ken’s name over Lord Haw-Haw’s broadcasts from Germany? It was also normal practice for the German Authorities to broadcast the names of recently captured servicemen through the radio transmissions of Lord Haw-Haw and other presenters, giving the name, address and sometimes, the service number of the newly interned Prisoners of War. The Lord Haw-Haw (actually William Joyce) broadcasts were designed to undermine the will of the British population, showing them how desperate their position was. Through these broadcasts the Germans, in the form of the Reich Ministry of Public Enlightenment and Propaganda, attempted to demoralize Allied troops, the British population and America before they joined in, whoever was within radio listening range, to put doubt in their minds on what they were being told through the Allied propaganda machine and to try to get the Allies around the negotiation table to discuss peace. Among many techniques used to attract listeners, the Germans broadcasts reported on the shooting down of Allied aircraft and the sinking of their ships, suggesting high losses and an ineffectiveness of the Allied forces. Although the broadcasts were widely known to be Nazi propaganda, they frequently offered the only details available concerning the fate of friends and relatives who did not return from bombing raids over Germany. 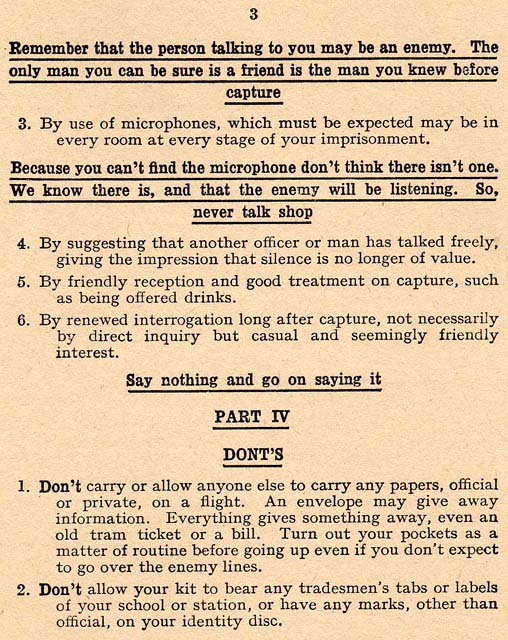 As a result, Allied troops and civilians frequently listened to the broadcasts in spite of the obvious propaganda and frequent blatant exaggerations, in the hopes of learning about the fate of downed aircrew, etc., leading to the British propaganda machine reporting on casualties as well to counteract this. Later in the war, when the V1 flying bombs started to appear, they were used to drop propaganda leaflets as they flew over Britain with POW letters. The Government went to great lengths to collect these leaflets and avoid public discussion about them, the fear being that any press reporting of where the leaflets were found would assist the enemy in the tracking the trajectories of the V1 rockets and assist in their accuracy. On the same day as Ken arrived at Dulag Luft, 6th July 1941, 11 Spitfires from 616 Squadron, fighter command, forming part of the Target Support Wing B for Circus 35, took off at 13.30 hours in support of Stirling Bombers on a raid to Lille, France. McCairns was taken to a country residence, transformed into sick quarters, where he received further treatment, a shot of morphine and fed sandwiches and coffee. Here he was told that an ambulance was on its way, with another downed airman, to take him to hospital. McCairns passed out in the ambulance and so escaped the questions from the imposter and was taken to St. Omar hospital. Here, they removed the bullet from his leg and re-bandaged it, but only after he had been asked to complete a form which included the question as to how he had been shot down, this he answered “Unknown” and everyone seemed satisfied. Not an hour later, however, he was woken up by an angry officer demanding to know the answer to this question in detail, apparently as there was a furious argument between the fighter pilot who shot the first rounds at McCairns aircraft and the flak post who got in the second bust as to who had actually shot him down. McCairns never settled the argument. J’attendrai – I will wait, in English. Alas, there is nothing for me to hear anymore. I am sure it sounds better in French, but for those who went on to suffer 4 to 5 years as POW’s, you can see the attraction to this song. On the 11th July they were both told that they were to be taken the following day to Germany and aroused at 3 AM, they were packed into an ambulance, together with a guard and two German dental officers returning home on leave and any spare space, being packed with looted goods being taken back to Germany. Derek Thrower described his time in Dulag Luft as a bewildering experience. There was talk of escape from Dulag Luft but the prisoners were not there long and they appear to have been actively discouraged by the permanent staff, who did not want reprisals on them for the prisoner’s acts of foolishness. There was talk of 18 Aircrew having escaped via a tunnel but their exploits were laughed at as childish by the staff. Reading many period reports of Dulag Luft would suggest that this was the case, that the permanent RAF staff were in the pockets of the German Luftwaffe however the senior officer in charge up until June 1941 was H M A ‘Wings’ Day, who assumed the position of Senior British Officer (SBO) and set up an excellent support system for the downed airmen, who were suffering from shock and humiliation having been shot down, probably with the loss of some of their crew, and now found themselves in German hands. They were not allowed to talk to the new prisoners until the German interrogators had what information they felt they could acquire but then their work started in adjusting the prisoner to life behind barbed wire. 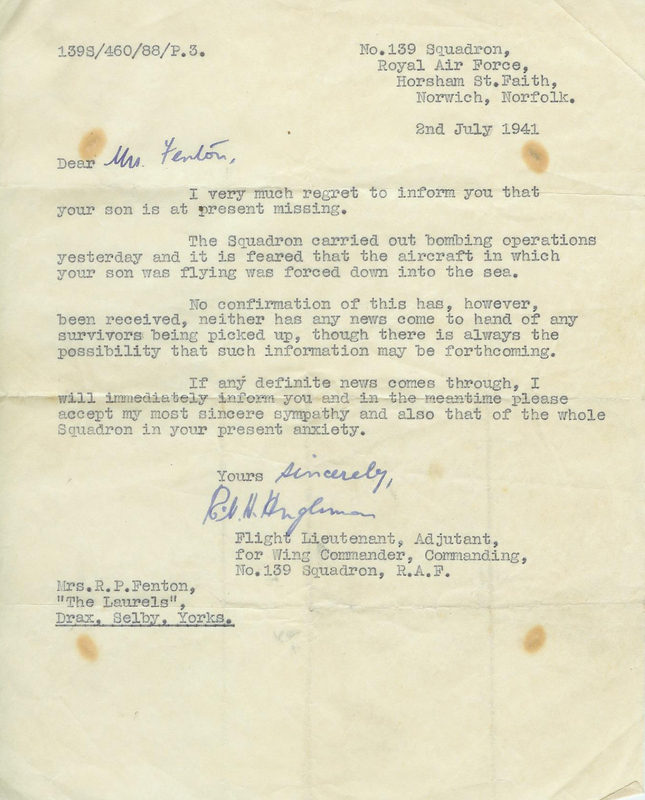 ‘Wings’ Day was eventually sent to Stalag Luft 1, Barth, having escaped from Dulag Luft, together with 17 other members of his staff, via a tunnel on 1st June 1941. Many of these escapees were to become part of ‘The Great Escape’ when some would be executed at that time rather than returned to their camps and this could in fact be considered as a rehearsal to the escape made in 1943. This tunnel, referred to earlier, was started in July 1940 through the floor of the senior French Officers living room in the west Block, with Jimmy Buckley in charge. The ground was wet and very stony and after quite a while, a very large boulder barred their way but they kept digging, intending to escape between September and December of 1940, but through October, digging had to be abandoned as the tunnel flooded and a further delay occurred when 26 POW’s were sent to other camps, Oflag IXa/h and Stalag Luft 1, including some of the main tunnel party, including geologist PO A H Gould. The tunnel was restarted in March 1941 when conditions permitted and pretty well finished by May the same year, with a planned escape on 1st June 1941. 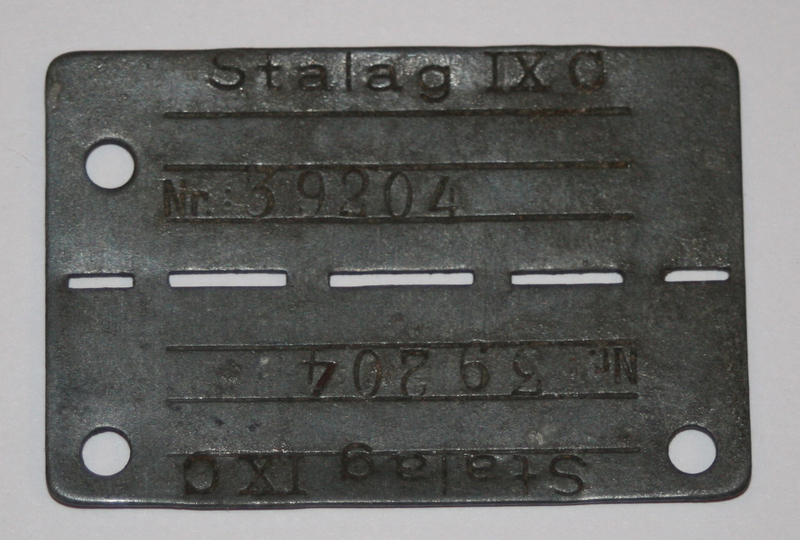 Those who were chosen for the escape included many of those involved with the Great Escape from Stalag Luft 3 in the Spring of 1943. The 18 who were chosen included FO R D Baughan, FO J B J Boardman, Lt Com Jim Buckley (Purged before Great Escape), Sq Ldr Roger J Bushell (Executed), Lt Com Peter Butterworth (The Actor), FO M J Casey (Executed), FO A B Corbett, FO J A Gillies, WC H M A Day (Recaptured), Major J B Dodge (Recaptured), FLt G B K Griffiths, WC N C Hyde, FLt A J Madge, Major R T Partridge, FO D E Pinchbeck, LtCom R P Thurston, Sq Ldr N H J Tindal, FO F H Vivian and FO P A Wimberley. After the war, Peter Butterworth applied for a part in the film ‘The Wooden Horse’, produced in 1950, but was turned down as he ‘didn’t look convincingly heroic or athletic enough’ for the part, but he did not tell them that he was actually there, as he was one of the vaulters involved. Later, in Stalag Luft III, Peter Butterworth was to meet and form a great friendship with Talbot Rothwell, who later went on to write the ‘Carry on’ series of films, in which Peter was to appear. Other friendships were formed by the pair with future actors including Rupert Davies, Stratford Johns (Like Peter Butterworth, both Royal Navy) and John Casson, the son of Lewis Casson and Sybil Thorndyke. Throughout their stay at Stalag Luft III, they were involved in many theatre productions, which were not only used to keep them busy but also as a distraction for the tunnels and other various escape activities underway at the time. All five remained very close friends after the war. Fleet Air Arm Officers including Lt Cdr J Casson, RN and Lt PE Fanshawe RN both of 803 Naval Air Squadron , were interned at Stalag Luft III, being shot down together on 13 June 1940 during a dive bombing attack on the German battleship Scharnhorst at Trondheim, Norway. Their Skua aircraft crashed at Stjornfjord, Fosen and both were captured by the Germans and taken POW, first to Dulag Luft near Frankfurt, then eventually arriving at Luft III. Peter “Hornblower” Fanshawe, spent his wartime mostly at Stalag Luft III where he was a member of the escape committee. Fanshawe was the real sand dispersal specialist at Luft III, utilising the method of disposal demonstrated in film “Great Escape” but the use of this was seen in earlier camps. Fanshawe was transferred to Belaria shortly before the escape and was played by David McCallum in The feature film about events in Luft III. Equally, whilst at Stalag Luft III, Casson acted as a code master for MI9 in various POW camps, and assisted Fanshawe in his role as a member of the Stalag Luft III “Great Escape” Executive Committee. Sub Lt Rupert Davies 812 Naval Air Squadron was shot down in his Swordfish with Lt N M Hearle and captured on 22nd August 1940. He became a post war TV and film actor, including ‘Z Cars’, with Stratford Johns..
Squadron Leader Bushell decided on a different escape but the others all used the tunnel to escape that evening, most being recaptured quite quickly, with the exception of Wing Commander Day who was out for 5 days. Bushell hid in the goat shed but was attacked by the goat before he was able to find a suitable hiding place. This is covered by Derek Throwers book and the McCairns diaries. When Ken arrived at Dulag Luft, Squadron Leader Eric Douglas Elliott was the SBO and was regarded with the same suspicions as the previous permanent staff and was the subject of great criticism and finger pointing, resulting in a court of enquiry being held at Stalag Luft 3, in conjunction with MI9, which found no evidence what so ever that Squadron Leader Elliott was involved in any charge of disloyalty. After the war however, further evidence was uncovered and additional investigations were undertaken but these again proved no more conclusive as to Elliott’s connivance with the enemy, being put down more to stupidity than anything else, not looking to antagonise the Germans to make sure the POW’s were well looked after. Any act of escape, he said, could ensure the removal of comforts or privileges so he therefore tried to dissuade any such attempts. Sergeant Harold Bell, captured on 26th October 1941 whilst flying with 75 Squadron, said in his Liberation Questionnaire about Collaboration:- British personnel at Dulag Luft suspected, particularly Sgt. Slowly and S/Ldr. Elliott. Asking personal questions about Squadron. Transferring Red X food to Germans. Depriving POW’s of Red X food by giving short rations or cutting supplies. Derrick Nabarro was transferred to Dulag Luft on 30th June 1941 but quickly transferred to a hospital 2 kms away in a wood the next day. Here he met up with Sgt. William (Bill) Hall and they occupied the top floor with 3 beds to a room. He was with Bill and one other British Prisoner but they were very careful not to discuss service questions. Nabarro spent two weeks in this hospital before being transferred to Stalag IXc on about 15th July 1941. They were given false Red Cross forms to complete, which they ignored. In truth, the length of time spent at Dulag Luft was dependent upon the number of captured crew passing through at any one time, as this was the only debriefing station in Northern Europe. It appears that Fenton, Nabarro and McCairn’s travelled to Bad Sulza together, having been paraded in the company of 50 NCO’s, to be told that they were going to a camp they had never heard of, Stalag IXc. Their personal items were returned as they rushed around collecting bits and pieces for the journey, saying their good byes and filling in a Red cross post card to be sent home telling their family that they were safe and were now POW’s. Two weeks later on the same journey to Bad Sulza, the guards were not so careful with the result that Sergeant Derek Thrower, a cricketing professional from Hockley in Essex serving in 405 Squadron who was captured on 15th July 1941 at Staplehurst, Holland, a tall fearsome looking redhead, jumped through the lavatory window. The screws to the window had been loosened by countless visits by many POW’s to the toilet, each one loosening the screws to the window a little bit. As the train was slowing down he made his escape at dawn but without any food, maps, compass or other provisions, it was not a well thought out or planned escape. Nevertheless, by jumping lorries on the Autobahn at night he managed to cover 200 miles in 5 days and in an exhausted condition, completely lost, had to give himself up. He was by then near the Czechoslovakian border. This is when Derek Thrower hatched the plan to escape. He was not chased out by the guard who seemed uninterested in the fact that he was in there alone for quite some time. He considered how he could get out of the tight fanlight and what he would do once he was through. He returned to the carriage, where the guard continued to watch the prisoner cutting up and distributing the food. He confided in other POW’s about his plan, including the man cutting up the food and arranged for POW’s to go to the toilet in relays with the bread knife and start to unscrew the screws securing the fanlight. The POW’s sent Thrower away so they could get on with their task and the afternoon dragged on to the evening and following a change of guard, Thrower was informed that all the screws had been removed except for two which were very loose and ready to remove. The POW had also put into the cupboard under the wash basin some rations for Throwers escape. The guards had just changed and they looked fresh and more aware of what was going on around them so Thrower sat in his seat planning his departure when he heard the guards telling everyone that they would be in Bad Sulza within the hour and so the urgency heightened. Thrower slipped from his seat and went into the toilet, closing the door behind him and quickly removed the last two screws. Thrower was not a small man and the problem of easing himself through the small window took time but he then found himself hanging precariously with another railway track below him. After what must have seemed like an eternity, he let go. Finding himself dazed and bruised, he picked himself up and made his escape, the guards in the carriage at this point being unaware of his departure. What had actually happened in the train was that whilst the POW’s distracted the guards, one prisoner slipped back into the toilet and replaced all the screws so it was not until everyone was back at camp and a role call carried out that Throwers departure was realised, causing good humour for the prisoners. Ken Fenton’s identity disc that he would carry for the next 4 years, issued at Stalag IXc, Bad Sulza, Prisoner Number 39204. Many now appear for sale on the internet, many broken in half to achieve twice the money but they were usually broken, one to be taken home as proof of the death of the Prisoner and the other left with the body as identification. ‘All cigarette lighters and knives were confiscated, but luckily, not wrist watches. And last, but not least, we were paraded in front of a third party and our full particulars entered, including a print of the left thumb. I had taken the precaution of smearing mine with chewing gum before blacking. The result was just a nasty smudge on the filled out form. The German swore but was much too lazy to rewrite another reference. One of the most interesting features of Nazi hated education was then illustrated. A group of young 6-year olds were promenaded round the saline baths and chanting “Wir….gegen nach England,” gesticulating and singing at us on each appearance. All the R.A.F. burst out laughing and the German sentries came dashing up threatening us into silence – it was not fitting to show mirth on such occasions’. When talking to Roger Daggett, he also recalled “Hell’s Kitchen” and the rats scampering around with some jollity, when jokes about the rats were made by the prisoners. He particularly mentioned Robert McDonald as being a very funny man and making comments about the rats at this time. They had arrived at Stalag IXc, Bad Sulza and really quickly realised, too late, how easy conditions had been at Dulag Luft.